Are You Accepting Of Your Vision? My energy healing teacher, with whom I’ve been studying for many years, often talks about how destructive self-criticism can be to our spiritual progress. And yet we all do it. We drop something accidentally in the kitchen, then instead of laughing at ourselves for rushing and not paying attention, we can start into a mental dialogue of “You clumsy idiot! You’re always making a mess!”, sounding like a punishing parent. When I do this, I find myself getting so rattled I usually drop something else! When I was growing up, I was good in school and at games, yet with my thick eyeglasses I felt defective. I don’t remember ever receiving sympathy and understanding for my poor eyesight, nor giving that to myself. 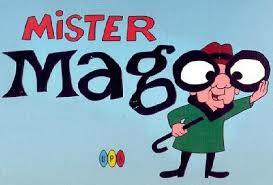 Someone in strong glasses was to be ridiculed, called Four Eyes or Mr. Magoo. This certainly didn’t help my vision, or my attitude about it. As I started vision improvement and paid more attention to how I talked to myself about my seeing, I was dismayed to find how negative I had been. As a child my mother used to regularly worry about “Nancy’s bad eyes”. So I’m sure I absorbed some of this idea that my visual system was broken, or at the least under-performing. This was upsetting to me as a top student. Now I think I have great eyes, which can usually see whatever I need them to see, if I give them enough time. Rushing and pushing myself are difficult habits to break, and I can see their negative effects on my vision. If I allow myself to get anxious, or try to make myself see something when I’m just too tired or not interested, of course my vision won’t be as good. In the past when I couldn’t see something right away as clearly as I wanted to, I instantly went into self-blame. It was the automatic triggering of that old programming, before I could stop it, telling myself “There you go again! Your eyesight isn’t very good today, is it? Maybe Mom was right that you have bad eyes!”, etc. etc. Well naturally this felt awful, making me discouraged and my vision even worse. When my teacher said self-criticism is not the way to motivate yourself, I was skeptical, as this was all I knew. Since she was right about so many other things, I figured I’d give self-encouragement a try with my vision, praising myself when I saw something clearer than before, or drove my car without fear on a rainy dim day. As I cheerlead my own vision, it rises up to meet my expectations, like a child who lives to the label of being a good kid. My vision coaching clients regularly talk about their vision in derogatory ways, like “Vision is not my gift” or “I can’t see a thing without my glasses”. Even “My vision keeps getting worse” can become a self-fulfilling prophecy. What if your eyes are perfect feedback mechanisms, showing you that you don’t really want to see that right now? You just want to rest, and have no new responsibilities. Your eyes aren’t mal-functioning at all! As I’m re-learning almost every day, listen to your eyes like you would to a good friend, and you’ll know what they need. If you appreciate your vision and all it shows you, it will give you even more to appreciate. Be good to your visual system, and it will be good to you. Cyber, yes, I believe in optimism. In fact here’s a post I wrote about it. 🙂 https://www.iblindness.org/4375/vision-and-optimism/. And blind optimism is not good — you have to keep your eyes open to new ideas which might differ from your own. Like natural health solutions that are not expensive pharmaceuticals or operations, natural vision improvement is slowly getting more attention, as people learn there is something they can do to help themselves, that they don’t have to be helpless victims of the medical establishment. And some mainstream docs do want to help and to learn about more natural solutions, they just weren’t educated that way in medical school.